I have had a variety of students with a broad range of academic abilities in my class at once. This hook doesn’t feel particularly deep until I stop and reflect for a moment on what that looks like. On one hand, I have taught in a school that did not allow honors classes until junior year, and on the polar opposite, in a school with quasi-rigid tracking via honors and non-honors. I have had students with developmental disabilities, and students who have taught me brilliant, beautiful insights. Now, these groups aren’t necessarily mutually exclusive, but to challenge every student to the best of my ability, I have employed a variety of tools within the “differentiation by readiness” tools. This figure below has inspired me as I plan and prioritize learning goals for my diverse set of students. Macroscopic view- Unit Plan: A descriptive unit plan of my mole unit (loosely based upon part of the Toxins unit from Living by Chemistry Curriculum, as purchased from Key Curriculum Press). Here’s a link to a post on my scope and sequence if you would like context as to where this fits into the school year. Note: This took me a few years of trial and error to develop. This unit is still tough for my students. In the grand scheme of things, I have found that even if students STRUGGLED in this unit, by the time we got to stoichiometry two units later, ideas had cemented for many. Nanoscopic view- Selections of a Different Quiz Versions: Four versions of a quiz my students took during the mole unit (note: they are loosely based upon a quiz in the Toxins 1 Unit from the Living by Chemistry Curriculum, as purchased from Key Curriculum Press, but now is accessible via Macmillian Learning). Below is a brief description as to how I used these tools. 1. Modified: Given to students who, in lieu of extended time, were given shortened versions of assessments. The school’s policy: if a student has extended time, the workload quickly builds up in every class to use that extra time. This was determined to be a potential spiral of doom for the student- thus the modified assessments. I typically eliminate a multiple choice response (3 choices vs 4), increase scaffolding on short answer and/or reduce the number of short answer questions, as shown below. 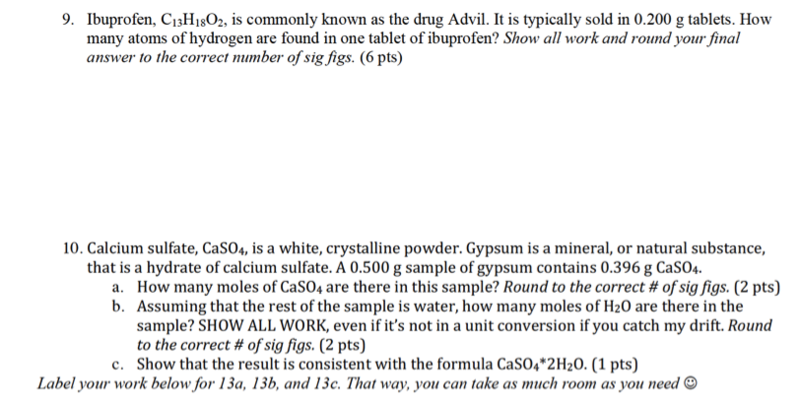 Additionally, there is added scaffolding in the short answer as compared to the General Chemistry version. 2. Regular: Given to (most) general chemistry students. There is one more short-answer question compared to the modified version, and there are 4 multiple-choice answers from which to choose. 3. Honors B1: Given to some honors students, some general chemistry students - it depended upon where they were at in their learning progression. 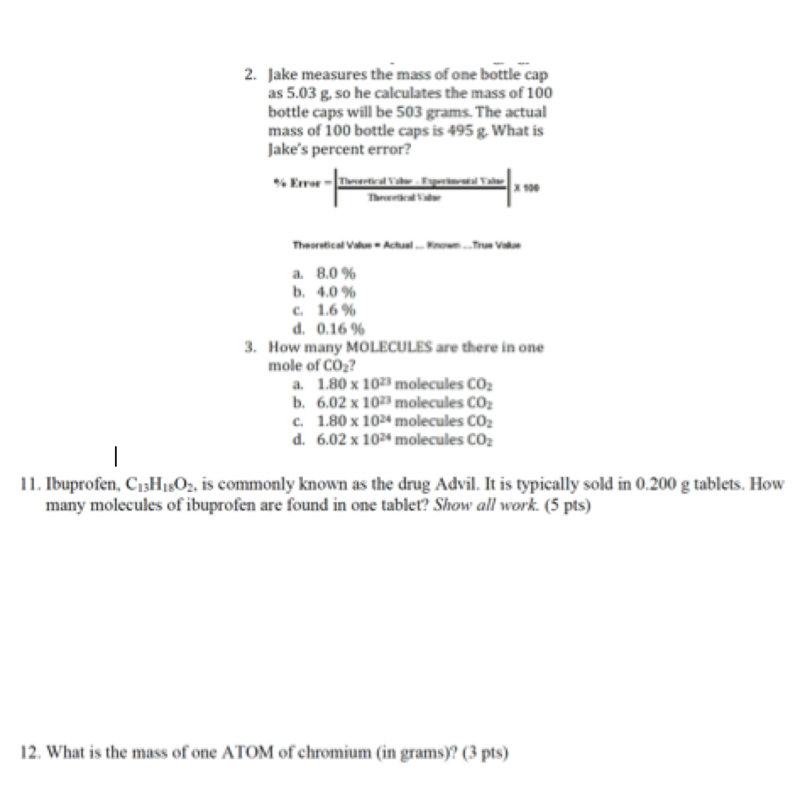 Some general chemistry students were more prepared for this challenge than honors. The multiple-choice is reduced by one question so that I can give more challenging/time consuming short-answer questions as shown below. 4. 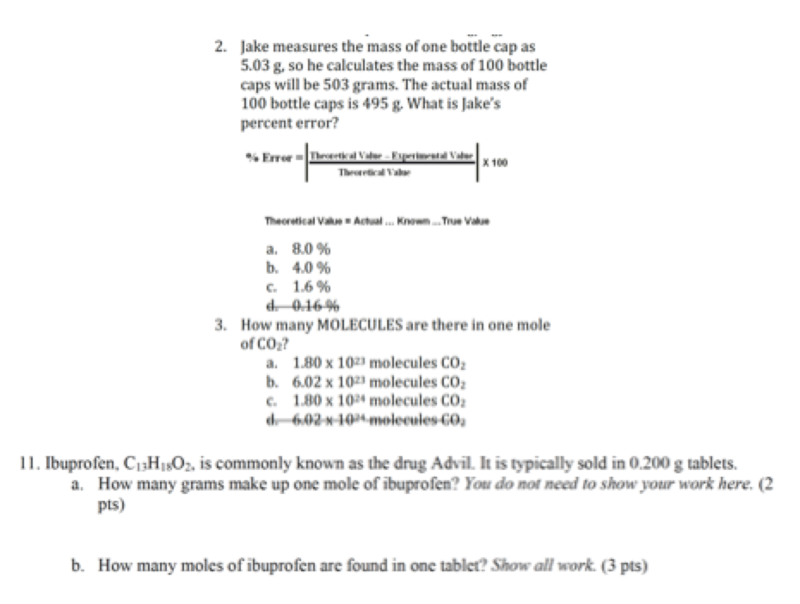 Honors B2: Given to some honors students, some general chemistry students (arguably fewer)- this has a TOUGH final short answer problem (source: “Placebos” task, Solving Real Problems in Chemistry, Pacific Crest). My top students had practiced with an analogous problem from the same college-level text prior. Thanks for reading- please share your differentiation tips if you have found things that work for you and your students! PS- Good luck to your AP students in the coming weeks.